I just reached rank 34 and unlocked the octavis cloptimus hat, and when it previewed me the hat it showed the model home hat, it was weird. They should've learned after pumpkin eye brawl. I expect there to be some disapproval from fans. This is why I just bought one, and it will remain unopened. There have been so many glitches in STT. Some are annoying, others are quite useful like Blackout's invulnerability/immortality glitch. I can't complete the level because sometimes when Me or my sister die and when we take out character off the portal, it still shows "this skylander needs to rest"
In co-op you probably need to take both off, then put the next characters according to the controller. The portal seems to confuse who is who sometimes. When it says that, normally both of you would have died. It just doesn't change to the other skylanders rest screen. I'm guessing that the character disappeared? Legendary bash's stone uppercut dosnt show a fist, it just shows a pile of stone. Any Bash does that, it depends on the terrain. Uneven places like Phoenix Psanctuary are a real pain with him because of that. 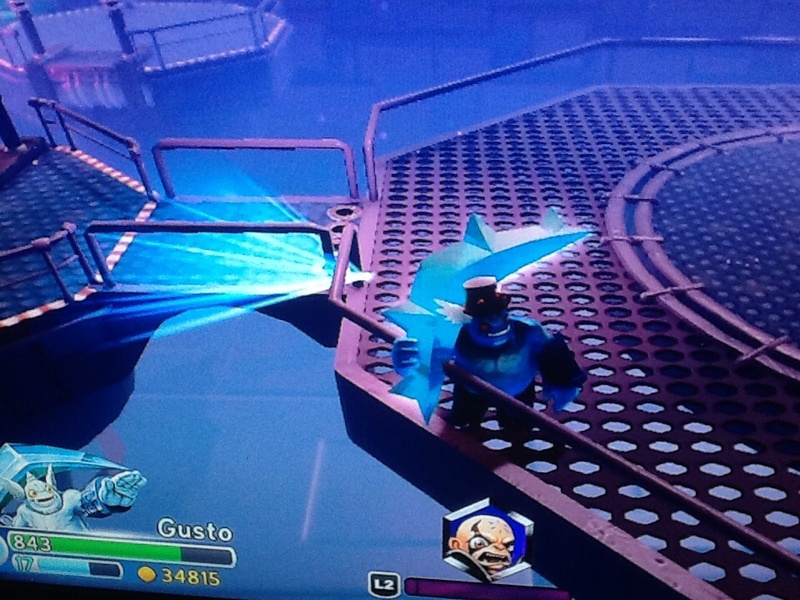 Glitch: I don't know what I done but I was using Chill Bill and couldn't switch to my Skylander and had to take out the Trap to play my Skylander, It also happened with another villain but I forget who it was. Glitch: Skylander and villain health/timer/exp bars/pictures,names Fusing together. i found a glitch that can occur at random but does not affect the game. how it is done i do not know as it occurred by random. the hub status bar for skylanders and the timer bar for villains and the names and pictures fuse together when playing as a villain. Interesting. People used to say you can do this with her charge move,but not simply switch in with her face smushed against the wall. Does it work on any other gate? Because if that's the case, I'll go and assume that there's something really weird with her hitbox that it reaches the area transition despite not even being able to teleport. I decided to start playing around with some series 1 Skylanders in Trap Team, and noticed a lot of them have some strange bugs. Some are only minor, but others are pretty noticeable. So far the biggest one I found, was on his Granite Dragon path. The stone fists don't even appear when you use them. They forgot to add the model I guess! Does anyone else know more of these kinds of glitches? The stone fists don't work in uneven terrain unlike in previous games, even if it's just a transition between grass and wood floor or something. No models missing, it's just horribly finnicky. Terrafin is almost completely ruined on Trap Team, even the Eon Elite, because his shark splash gets blocked before he can do it pretty easily now, was not that way before Trap Team. That's not a glitch. It's a nerf. Seriously, Terrafin was WAY too overpowered in previous games. It's not exactly a nerf, it's probably the same issue as Cynder's Shadow Strike - because she has a hurt box in it for some reason in this game she also has a hitbox,and can get hit despite Shadow Dash being about avoiding damage. Hopefully it was just an oversight by the devs and will get fixed next time. Yeah, sadly it glitches a lot. The Portal is the big one. Battle arenas also glitch, where only Player 2 gets the money in stages. The final amount goes to both luckily. In Swap Force, Rubble Rouser and Stink Bomb, when put on the portal together from the start menu often appear in game as Swapped! This might only be for us though! I'm currently replaying Trap Team. When I collected High Five's soul gem, the game played the music for Skylanders: Giants instead of the trap team one. I believe that there is a common issue in the games that when there are two-players, certain bugs and glitches occur. Like in Swap Force, on the Boney Islands, when Avril fired at the locked door and the lock was gone, the door didn't open until I attacked the door. Then on the Winter Keep, we destroyed two of the Blizzard Bollers, but the game skipped over the last one that was still firing at the Keep. And we couldn't get back to the minigame to destroy that last Blizzard Boller. Another bug recently happened to me and my neice while in the Phoenix Psancturary level. When we collected the second seed, Flynn did not say the usual quote as they flew over us on Whiskers, "WHOA! Bird travelling still freaks me out!" He just said nothing. Anyways. I did that got the trophy. Went to go see the trophie and the console crashed. Error message said data may be corrupted and scan will now preform. Everything was fine. I turned the system back on and it said. System did not turn off correctly last time would you like to report this to Sony? I was plying with my friend on his Wii U the otther day. I forgot which skylander he was, but I was Zap. As his skylander died/feinted, Zap died offscreen. All you could hear was the sound of Zap getting hurt. We were plying the doomchallanges, last level. maybe a life skylander grabbing a soul gem for another lifer? Big hats that are previewed in LC Hex preview in normal size, but when selected, become gigantic to cover her headdress. However, when going back to the game, they're back to their actual size. Same happens when selecting a trinket with said hats already on. Mostly harmless but I almost gave up on one that matched her nicely because at first it looked misplaced, so here's to raise some awareness for those who might've ran into that. Another interesting hat bug for those in Swap Force...try putting ANY hat on Gill Grunt. It appears on his face. Game could've used another 3-4 months of bug squashing easy. in kaos level, i exited the door near the tech element gate, and fell into an endless void. Also does anyone know what the first update for trap team was? There was a day 1 patch on the Wii U, but I think that may have been just for the online message thing. I also had a glitch just the other day when I was opening a treasure chest. While the gold was coming out of the treasure chest, my sister switched the traps in the portal, and then after the new villain loaded I found that I couldn't pick up the gold from the treasure chest. I just walked right through it like it wasn't even there. I also had the Chef Pepper Jack moonwalk glitch once, and while using Snap Shot, I managed to get into the area of a villain cutscene, so while the cutscene was playing, Snap Shot got in the way of it. Please use the guide in the OP, no one can even find out how to reproduce the glitch if you don't specify where,in what console,to what villain,etc. Glitch: Jumping after Rain of Skulls, no specific timing needed but at least up until a full second, negates the attack even if the animation has finished, the skulls never come down. Also happens if she hits a bouncing hazard in the final Arena Challenges. No solution that I know of, the game seems to think you jumped halfway through the charge even if it has finished already. Was playing the last chapter, exited before I defeated/captured Kaos. But when I went back to the academy I got the end-of-game cut scenes. When I look at Kaos' wanted poster it clearly says not defeated/captured/upgraded but every character I bump into continues to insist I won the game. Anybody else run into this issue? You probably can just select Ultimate Weapon chapter menu. Doesn't seem to happen on X360 since I did that a few times. If not, your save might be ruined. When I fight Dreamcatcher on my Wii it crashes and it turns my whole wii off. It literally took me days to finish the fight because it kept crashing. Happens a lot, so far only with Shroomboom. Happens with many different hats, noticed while porting them from Swap Force 360. EDIT: I mean Lightcore Shroomboom. Problem: One of the blocks I needed to push to get the hat had no arrow, meaning I was unable to push it. I first thought I was being stupid and was overlooking something, but after 15 mins I looked at a LP of the level and discovered that the arrow wasn't there. Solution: Skipped it (irritated me so much). You can also restart the level. All of a sudden his scissor walk isn't working. Anyone have the same problem. You'll need to be more specific than that. Where did it stop, elevated terrain, different floors,getting attacked,how did it happen?